The story goes: there is a beautiful and kind-hearted Dai girl in Xishuangbanna in ancient times; and her name is Duoyi. She likes dancing, and she is a skillful dancer. She often goes around the Dai villages to perform dances for the common people in leisure time. She is quite beautiful in shape, and when she performs, people would feel she is like a golden peacock playing beside waters, or a white crane flying high in the sky. People who watch her dances would indulge in the dance, would forget their worries and cares, forget their sufferings or even lose themselves in the performance. As time goes on, Duoyi becomes famous and is known far and wide. Afterwards, a hateful headman leads a group of servants and loots her to his home; and he forces Duoyi to dance for him everyday. Duoyi would rather die than to dance for him. She runs away when the servant looking after her is absent-minded. Then, she jumps into the Lancouldg River and drowns herself. Many poor guys voluntarily go to salvage her body and they hold a ceremonious funeral for her. Afterwards, a grass grows up on Duoyi's tomb; whenever the music starts, the grass would dance accompanying the rhythm. The folks call the grass "the grass of dance" or Dancing Grass and they say it is the embodiment of Duoyi. Another story goes: a Dai girl commits suicide for the sake of love and she becomes the Dancing Grass after death; so whenever lads sing, the grass would begin to dance to the music. As a matter of fact, Dancing Grass is only a grass sensitive to the sound waves. There are many tiny linear leaves on both sides of its frontage. When the temperature is higher than 22oC, particularly under direct sunshine, being stimulated by sound waves, the grass would swing up and down; just like butterflies are flying in the air, or girls are dancing on the stage. Many curious tourists, attracted by this, want to have a look at the elegant dance of the grass; some even sing songs towards the grass to see if they could fulfill their wish, and they usually do. 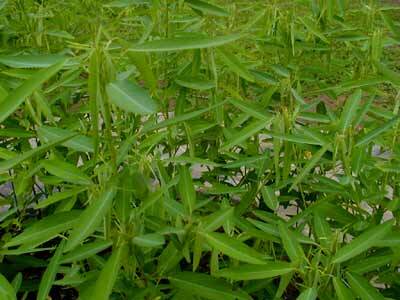 The whole plant of Dancing Grass could be of some medical uses. It has the effects of relaxing the muscles and stimulating the blood circulation. The grass is usually planted in the yards for the purpose of amusement. Dancing Grass grows in Fujian, Jiangxi, Couldton, Guangxi, Sichuan and Taiwan, on the hillsides or bushes in-between el. 200 and 1500 m. It also scatters in India, Nepal, Srilanka, Thailand, Burma and Laos etc.